I am an advocate, blogger, founder of Facebook support groups for supporters, and trauma recovery coach in training. I am married to a male survivor of childhood sexual, physical, emotional abuse who has complex Post Traumatic Stress Disorder. I have written a free resource guide for partners called: For the Partners of Childhood Trauma Survivors: 6 simple steps to help you survive and thrive while living with your partner’s traumatic past. See my website to download. My vision is to bring awareness to the needs of childhood trauma survivors and their supporters and to contribute to the creation of accessible and affordable trauma-informed supports to serve these two groups. The Body Keeps the Score by Bessel van der Kolk. This book was my ‘Aha’ moment about the impact of childhood trauma. When I discovered this book, so much of my husband’s responses made sense: Why he was not improving with talk therapy alone, his interpersonal challenges, and things like struggles with memory, concentration, and planning. I recommend this book to supporters because you don’t need to be a clinician to benefit from it. 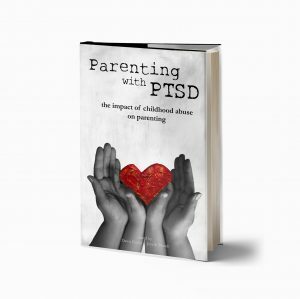 It includes many stories, breaks down brain science into digestible bites, and explains key concepts about childhood trauma without overwhelming the reader. It also provides an overview of evidence-based therapies, which is helpful when looking for professional help. If you could tell a partner of a survivor with PTSD one thing, what would it be? I would strongly urge partners to understand the basics of what trauma does to the brain. The brain of a child who grows up in ongoing trauma, abuse, or neglect undergoes neurological changes. For example, brain scans show that the amygdala enlarges and the hippocampus shrinks. Bessel van der Kolk describes the amygdala as the ‘smoke detector’ of the brain. In survivors, the amygdala is highly sensitive meaning that the smoke detector is always ‘on’. The hippocampus is responsible for memory processing, especially emotional memories. Due to trauma, the hippocampus has difficulty integrating short term memory to long term resulting in a survivor experiencing the past as if it is still happening in the present. Understanding that the responses of a survivor are likely a result of brain changes due to past trauma can help partners to depersonalize the reactions. It really is a brain injury. It is not a willful choice or an individual being resistant or difficult. Fortunately, we know that the brain is able to heal and learn new ways of responding, a result of neuroplasticity. It takes time, practice, and often, trauma-informed support. What is one self-care practice that you use to help keep yourself in balance while working with trauma clients? It’s hard to identify just one because I live with a person with complex PTSD and read about it, blog about it and work with others impacted by childhood trauma every day. If I had to choose one: running or walking outdoors, which also includes nature meditation. This means that when I’m out running or walking, I am intentional about noticing the sights, sounds, and smells of nature around me. Often, I find myself smiling when I notice something that captures my attention. Research shows that nature is calming to the limbic system and I certainly find that to be true. Fortunately, I have exercised for most of my adult life so it is also a familiar and comforting practice. I love how Babette Rothschild in her book 8 Keys to Safe Trauma Recovery elaborates on this well-known phrase. “‘When life gives you lemons make lemonade’ is a catch phrase that has come to stand for turning life’s adversity into benefit for yourself or others. To make lemonade means to rise above the lousy hand you were dealt, making the best of it and helping others despite or in spite of it.” – Babette Rothschild, 8 Keys to Safe Trauma Recovery: Take-Charge Strategies to Empower Your Healing. What is the most common concern you hear from (partners of) survivors? Partners often ask how they can help their partner who is a survivor. But I suspect the question ‘How do I help?’ goes deeper. Being a partner to a survivor means experiencing a lot of helplessness. A partner can’t change what happened, can’t alleviate a loved one’s suffering, or exact enough justice to make up for what happened. Instead, the partners can educate themselves about the impact of trauma, ensure they are implementing self-care, address any of their own issues that arise as a result of living with a survivor, access trauma-informed resources for themselves and their partners, and find new ways to connect with your partner. These are the practices I outline in my book. Being in a relationship with a survivor means deep acknowledgement and acceptance of human suffering. That’s hard. In the end, I always try to keep a ‘good enough’ perspective. I am doing the best I can. That’s what I encourage all partners to do: the best they can.